← Grumble. Saaaaaaad. The hell? 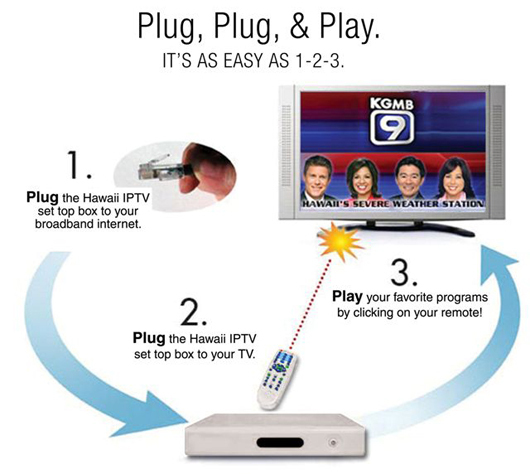 It’s only April, but I’m ready to crown a winner for stupidest product of the year: Hawaii IPTV. I love most things Hawaii, so I was intrigued when the email hit my Inbox. I’ve written before about how IPTV will allow us to personalize our experience well beyond what’s available on satellite and cable. I could watch Hawaiian television content from the mainland. Sounds great, but there’s a big but. Instead of just delivering content that works with existing hardware, Hawaii IPTV requires that you purchase and install a separate settop box. For only $125. Imagine having to have a separate box for each channel you like: ESPN, CNN, Comedy Central. And don’t forget the remote for each of those. At least Vudu and MovieBeam had a broader audience base. This thing has no chance. Did I mention that the service is an additional $21.50 a month?